Criminalize Conservatism: Why Are Americans So Passive? Why Are Americans So Passive? 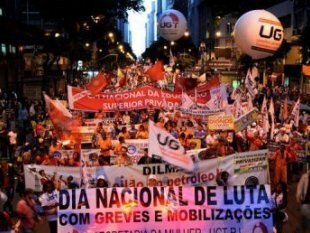 Brazilian workers march in Rio de Janeiro, on July 11, 2013. R.J. Eskow's oped in Alternet.org on July 12th, "Why Are Americans So Passive?," asks, "The rest of the world is rioting in the face of massive inequality and injustice. Have we absorbed the oppressor's consciousness?" Since the judicial coup de etat by the Supreme Court Five in 2000, and many times since, we have been asking the same question: Why are Americans so docile, so sheeplike, when other countries hold their governments' feet to the fire? "Why Are Americans So Passive? A typical flock of American domesticated sheep. "From the first breaths of life to the last, our lives are being stolen out from under us. From infant care and early education to Social Security and Medicare, the dominant economic ideology is demanding more lifelong sacrifices from the vulnerable to appease the gods of wealth. "Middle-class wages are stagnant. Unemployment is stalled at record levels.College education is leading to debt servitude and job insecurity. Millions of unemployed Americans have essentially been abandoned by their government. Poverty is soaring. Bankers break the law with impunity, are bailed out, and go on breaking the law, richer than they were before. "And yet, bizarrely, the only Americans who seem to be seething with anger are the beneficiaries of this economic injustice – the wealthiest and most privileged among us. But those who are suffering seem strangely passive. "As long as they stay that way, there will be no movement to repair these injustices. And the more these injustices are allowed to persist, the harder it will be to end them. "Where the hell is the outrage? And how can we start some? 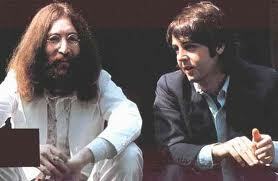 Probably not the real "John and Paul." "Paul Krugman ruminated about inflation-free unemployment the other day, and he was feeling pretty grim. Krugman is frustrated that clear prescriptions for this kind of economy – prescriptions born in John Maynard Keynes’ day – aren’t being followed. What John proposed then, Paul’s proposing now. "He’s right. A number of studies have linked political participation with economic conditions, typically with results like those Krugman describes. But that doesn’t explain why Brazilians took to the streets in such large numbers recently. "A majority of Brazilians believe that their economy’s improving, according to a recent Pew survey. 59 percent of Brazilians rate their economy positively and 74 percent say their personal financial situation is good. By contrast, the same organization’s most recent US polling showed that only 46 percent of Americans said they believe the economy’s getting better, while 50 percent think it’s getting worse. "The polling says that Brazilian political unrest is driven by a divergence in goals and priorities between political leaders and the population, triggered by poor public services, bus fare increases, and the cost of hosting the World Cup. "A similar divergence of priorities exists in this country. Washington’s been focused on deficit reduction, while the public wants more job creation and economic growth. But Americans are quiescent. "US voter turnout is extremely low when compared to other developed nations, even though we rank among the highest in terms of income inequality. And other forms of political expression are also under-used. The Occupy movement was originally very popular, for example, but most people were easily persuaded to abandon it and return to a state of quiet desperation. Escaped sheep being led back to pasture with the enticement of food. This method of moving sheep works best with smaller flocks, and just like the U.S., fattening them up is the mark of the shepherds' success. "Wealth inequity and other economic injustices are the product of deliberate policy choices – in taxation, Social Security, health care, financial regulation, education, and a number of other policy areas. So why aren’t Americans taking action? "The change' theories Krugman mentioned don’t tell the whole story. For one thing, it’s not true that the lives of the majority are frozen in an ugly stasis. Conditions continue to become objectively worse for the great majority of Americans. But these ongoing changes – in actual wages, in employment, in social mobility and wealth equity – have received very little media attention or meaningful political debate. "It’s not that things aren’t changing. It’s that people don’t know they’re changing. And without that knowledge the public becomes a canary in a coalmine, only aware of its declining oxygen supply when it keels over and dies. "It’s an almost classic state of alienation, in which people may be acutely aware of their own increasing difficulties (although sometimes they can be numb to that as well) but experience them in a state of isolation. That turns the anger inward, leading to crippling reactions like guilt and despair. And repeated individual failures – failures made increasingly likely in a skewed system – lead to a sense of learned helplessness. "Interestingly, the 'change = political pressure' theory helps explain the rage of the 'radical rich' who – despite their almost unprecedented lives of wealth and privilege – are articulating an anger which seems at first to be inexplicable. But they, unlike the vast majority, are experiencing perceptible (if minor) changes. "No current policy proposals would substantially affect their historic levels of wealth and privilege. But some Democratic policies would slightly discommode the ultra-wealthy, and conservative forces have been shrewd enough to trumpet that fact far and wide in a tone of barely suppressed hysteria. "The wealthy have already seen a cultural change, as the Occupy movement led to previously-unheard public criticisms of their riches and political influence. That helps explain today’s seemingly paradoxical political situation, in which the beleaguered majority accepts the injustices heaped upon them while coddled and ultra-wealthy Americans erupt in fury. Sending in the SWAT team to break up demonstrations. "The media has failed to tell the story of our broken economy. The two-party system is failing, too, as corporate forces complete their corruption of the GOP and seize an ever-increasing chunk of the Democratic Party. "That’s one of the reasons why voter turnout may not be the best indicator of political awareness. Even pronounced financial hardship won’t result in increased turnout or participation in electoral politics if neither party is clearly articulating the majority’s needs or actively fighting for its interests. "In fact, they’ve said it for the last fifty years. "And yet technology jobs were down in last week’s jobs report. 'Structural unemployment' is another way of telling you it’s your fault if you don’t have a job. It’s a lie. "Even worse, decades of 'Pimp My Ride'/'Lifestyles of the Rich and Famous' acculturation have idealized the wealthy and have left the majority with a subliminal message: If you’re struggling economically, it’s your fault. "The leftist Brazilian educator Paolo Freire spoke of 'internalizing the oppressor consciousness': internalizing the values of those who colonize, rule, and exploit you, accepting their distorted, Matrix-like view of the world as an objective reality. "This can lead to agony, as well as continued exploitation. When I first began writing about illegal foreclosures in 2009 and 2010 – before bank fraud became common knowledge – I began receiving dozens of emails from bank victims saying, in essence, 'I thought it was my fault' and 'I thought I was the only one.' Some of them had contemplated suicide, which is the tragic end point of an 'oppressor consciousness' within. "Books and films like The Pursuit of Happyness have delivered the message that anyone who’s struggling economically hasn’t been brave enough, bold enough, or smart enough, while movements like the Tea Party have mocked underwater homeowners and other victims of Wall Street fraud and predation. "The last two Democratic Presidents have tried to have it both ways, exalting, deregulating, and pampering the wealthy while speaking the language of justice. That has weakened the Democratic 'brand' and undermined public confidence in government, while failing to resolve our underlying economic problems. The rhetoric of 'consensus' and 'compromise' contributed to the decades-long rise in inequality. Not all of the sheep are white. "1. Expand our avenues of political expression: First, we need to remind ourselves that electoral politics is not the only productive avenue for political activism –that we need strong and independent voices and movements. "2. Refuse to let politicians use social issues to exploit us economically: We also need to reject the exploitation and manipulation of progressive values by corporatist politicians who use social issues like gay marriage and reproductive rights exactly the way Republicans do – to manipulate their own base into ignoring their own economic interests. Politicians who don’t take a stand on economic issues should be rejected, up and down the ticket. "3. Explain what is changing – and contrast what is with what should be: We need to do a better job of explaining what’s happening, so that we can make people aware of the harmful changes taking place all around them. "And it’s not just about 'change': It’s also about contrast – between economic conditions as they are, and conditions as they should be and could be, if we can find the political will. There *are* coyotes out there! "4. Expand the vocabulary of the possible: The 'learned helplessness' outlook says 'the rich and powerful always win; we don’t stand a chance.' History tells us otherwise. From the American Revolution to the breaking up of the railroads, from Teddy Roosevelt’s trust-busting to FDR’s New Deal, from Ike’s Social Security and labor union expansion to LBJ’s Great Society victories, we need to remind ourselves of what we’ve accomplished under similar conditions. "5. Tell stories: And we need to tell stories – human stories. That’s why Tuesday night’s Bill Moyers special on PBS is so important. “Two American Families” tells the story of a white family and an African-American family in Milwaukee over two decades. Their stories bring home, in a personal way, the agony that has accompanied the destruction of middle-class jobs – a destruction that only happened because politicians made conscious policy decisions. "RJ Eskow is a writer, business person, and songwriter/musician. He has worked as a consultant in public policy, technology, and finance, specializing in healthcare issues." How Conservatives like their sheep. While an excellent explanation of why Americans are so sheeplike, and Wikipedia tells us a bit more about them in their entry on sheep, we still don't have a real plan to get the Sheep out of their comfortable pens and out into the streets: Sheep (Ovis aries) are quadrupedal, ruminant mammals typically kept as livestock. Like all ruminants, sheep are members of the order Artiodactyla, the even-toed ungulates. Although the name "sheep" applies to many species in the genus Ovis, in everyday usage it almost always refers to Ovis aries. Numbering a little over one billion, domestic sheep are also the most numerous species of sheep...Sheep are most likely descended from the wild mouflon of Europe and Asia. One of the earliest animals to be domesticated for agriculturalpurposes, sheep are raised for fleece, meat (lamb, hogget or mutton) and milk. 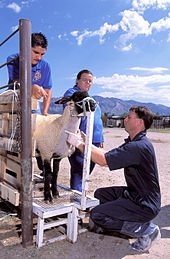 A sheep's wool is the most widely used animal fiber, and is usually harvested by shearing. 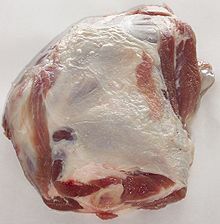 Ovine meat is called lamb when from younger animals and mutton when from older ones...Sheep have had a strong presence in many cultures, especially in areas where they form the most common type of livestock. In the English language, to call someone a sheep or ovine may allude that they are timid and easily led, if not outright stupid. 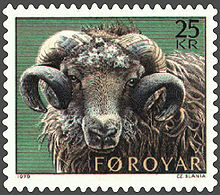 In contradiction to this image, male sheep are often used as symbols of virility and power; although the logos of the St. Louis Rams and the Dodge Ram allude specifically to males of the speciesbighorn sheep, ovis canadensis. Sheep are key symbols in fables and nursery rhymes like The Wolf in Sheep's Clothing, Little Bo Peep, Baa, Baa, Black Sheep, and Mary Had a Little Lamb. Novels such as George Orwell's Animal Farm, Haruki Murakami's A Wild Sheep Chase, Thomas Hardy's Far from the Madding Crowd, Neil Astley's The Sheep Who Changed the World (which features a cloned sheep) and Leonie Swann's Three Bags Full: A Sheep Detective Story utilize sheep as characters or plot devices. Poems like William Blake's "The Lamb", songs such as Pink Floyd's Sheep andBach's aria Sheep may safely graze (Schafe können sicher weiden) use sheep for metaphorical purposes. In more recent popular culture, the 2007 film Black Sheep exploits sheep for horror and comedic effect, ironically turning them into blood-thirsty killers...Counting sheep is popularly said to be an aid to sleep, and some ancient systems of counting sheep persist today. Sheep also enter in colloquial sayings and idiom frequently with such phrases as "black sheep". To call an individual a black sheep implies that they are an odd or disreputable member of a group. This usage derives from the recessive trait that causes an occasional black lamb to be born into an entirely white flock. 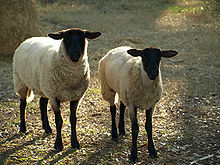 These black sheep were considered undesirable by shepherds, as black wool is not as commercially viable as white wool. 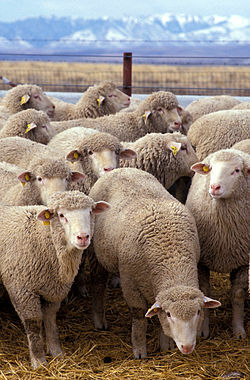 Citizens who accept overbearing governments have been referred to by the Portmanteau neologism of sheeple. Somewhat differently, the adjective "sheepish" is also used to describe embarrassment. Followers of Christianity are collectively often referred to as a flock, with Christ as the Good Shepherd. What separates us from those who took to the streets in the '60s and 70s? Was it only the deaths of our friends and loved ones that persuaded us that the only way to stop our government from more killings of innocents? Other countries demonstrate for other reasons, rigged elections, power of special interest groups - in the U.S., groups of people get together for football games and mob dances. Next: More on Protests and Demonstrations. in the library and I'd written a thousand stories." gathered together as The Martian Chronicles (1950) and The Illustrated Man (1951).